EUCROWD consortium partners gathered primary and secondary sources on citizens crowdsourcing using desk research method. A collection of 100+ resources on crowdsourcing as an e-participation method and as a means of fostering European citizenship and improving conditions for democratic engagement at the EU level is available to public for free as a part of the open access on-line repository. 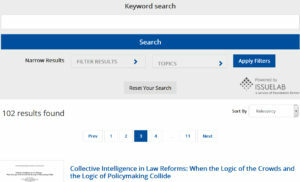 The Knowledge centre on Crowdsourcing includes articles, case studies, evaluations, papers, presentations, and toolkits. The Knowledge centre is available at http://ecas.issuelab.org/?category=Crowdsourcing.